Step aside, Franzia. 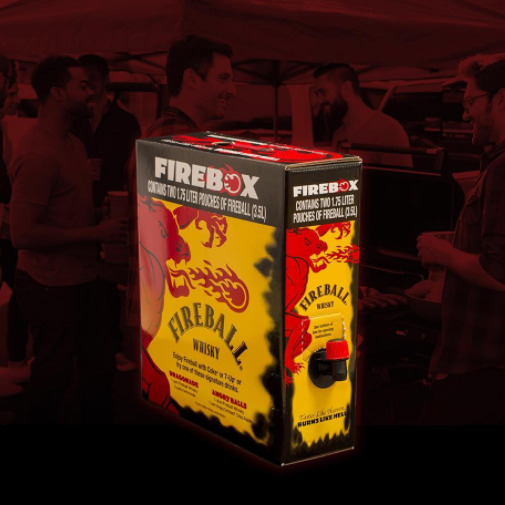 Boxed Fireball Whisky – aka Firebox (clever!) – is now a thing. And it's here just in time to get you liquored up for the holidays. We're not entirely sure who can or wants to stomach more than a shot of the spicy sweet stuff, but Sunday morning's hangover-in-bottle-form can be yours for $42.99 at select retailers. This is either the best or worst news you've heard today, and while we're betting on the latter, you shouldn't dismiss the box from making an appearance at your next ugly Christmas sweater party. The point is to get everyone wasted, right? And Fireball seems like it could accompany every type of holiday beverage (eggnog, hot toddies, hot chocolate, etc.). As long as you have a friend or co-worker willing to hold your hair back by 11 PM, this may not be the worst idea after all. But please, by all means, purchase your 2.5 liters of nozzled booze and drink responsibly.